Find hotel near Museum David And Alice Va ..
David van Buuren was a private banker in Brussels. 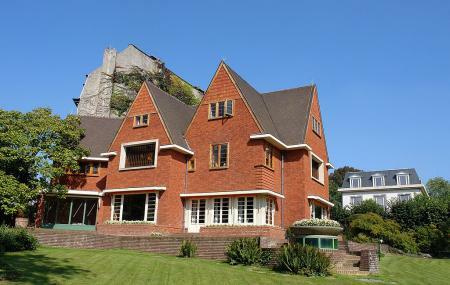 He had this house built in the 1920s in Amsterdam School style, but interior is entirely Art Deco. He and his wife, Alive, were prominent art collectors and thus decorated their home with the works of many celebrated painters including Van Gogh, impressionist Gustave van de Woestijne, and Tsuguharu Foujita, covering about five centuries worth of art. Most of the paintings are Flemish and Italian. They also collected stained glass, furniture, scultpure and modernist carpets. In 1970 their house was turned into a museum. Outside their house is a lovely 1.5 hectare garden, divided into three parts. These are the Picturesque Garden, the Labyrinth, and the Garden of the Hearts. Inquire at the museum for details of group reservations and rentals. How popular is Museum David And Alice Van Buuren? People normally also visit Rouge Cloitre Abbey And Park while planning their trip to Museum David And Alice Van Buuren.